Polish Hound: [Guest Post] The Mercurial Magpie: KBShimmer Mail & Gradient Stamping! [Guest Post] The Mercurial Magpie: KBShimmer Mail & Gradient Stamping! Hey everyone! Today's guest post is from Kirby of The Mercurial Magpie. Kirby was one of my very first nail blogging friends, and we both became interested in nail polish and nail art on the same forum, so she's one of my favorite bloggers for that reason. Not to mention her fabulous nail art, reviews, and swatches! Seriously, Kirby is amazing at stamping and gradients, specifically, and I'm always inspired by her designs! I'll let her take it from here! Hey, guys, I'm Kirby from The Mercurial Magpie. Cait was one of the first other bloggers I met during my initial polish obsession phase on a forum that we both posted on. I remember scrolling through her blog during those early days and totally drooling over the polishes that she swatched & the awesome nail art she posted. She's always been a huge inspiration to me as a blogger- I really admire her beautiful photos, interesting bottle shot compositions and honest, kind reviews. So, I was totally psyched when she asked me to guest post! Plus, her dog is absolutely adorable! The mail time posts featuring Hambone are some of my favorite on her blog. 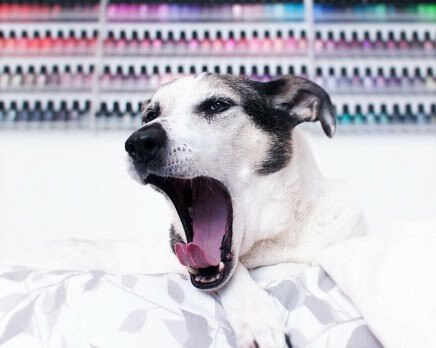 In honor of this guest post, my dog Mugen decided to attempt it with a recent KBShimmer purchase. He wasn't quite as good of a sport as Hambone- he went through various stages of "You're really going to make me do this" to just plain unimpressed. Rude. So, onto the nails. Like I said before, Polish Hound inspires a lot of purchases from me. Cait was 100% correct when she said that everyone goes through a taupe phase at some point- I am in the midst of one and don't see it ending anytime soon. When she posted her swatches of her picks from the OPI Brazil collection, I raced off to Ulta to pick up Steady As She Rose. But when I got there I was immediately blinded by the gorgeous taupe of the collection, OPI Taupeless Beach. It wasn't until I got home that I even realized I'd purchased the wrong one! (This reminds me, I still need to pick up Steady As She Rose At Some Point.) I hadn't used it yet so I thought this would be a great opportunity to slay an untried and do some nail art! Cait & I both swatched the new Zoya Naturel Deux collection recently and I thought Zoya Aubrey would go great with Taupeless Beach in a gradient! I used A England Princess Tears to stamp on a design from the Bundle Monster BM-H15 plate. I finished everything up with a coat of Out The Door. I love how well Princess Tears went with the other two colors and loved how this came out! Thanks again to the lovely Cait for letting me guest post on her awesome blog! If you're interested in checking out more from me, check out the links below! What a nice guest post! The gradient and stamping look good together. Unimpressed dogs are my favorite!! So funny. He is so dignified and unimpressed!